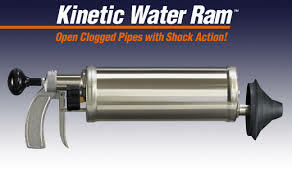 The Kinetic Water Ram uses a burst of compressed air that drives a shock wave (kinetic energy) through water to break up stoppage. It s particularly useful when the stoppage is on the far side of a drum trap or series of tight bends, since the shock wave can travel around bends without losing its force. Used for quickly opening clogged sinks, toilets and tubs. It handles rust, grease, sediment, and scale in lines up through 4 in diameter. * Please call us with any questions you may have about our water ram kinetic rentals in Tacoma WA and Puyallup WA, serving the South Sound.